the horizontal vibrations, while the lower three correspond to the vertical vibrations. In the case of the red radiations it will be noted that, whether there is a magnetic field or not, there is no particular change for red cadmium light when the horizontal vibrations alone are considered. When the field is on, the vertical vibrations give a double line, or possibly one of more complex form. In the case of the blue radiations, however, when there is a magnetic field and only horizontal vibrations are allowed to pass through, the line is double. The doubling is very distinct, and the separation is so wide that it should be easily seen by means of the spectroscope. When the vertical vibrations alone are allowed to pass through, there is a very much more complicated effect. 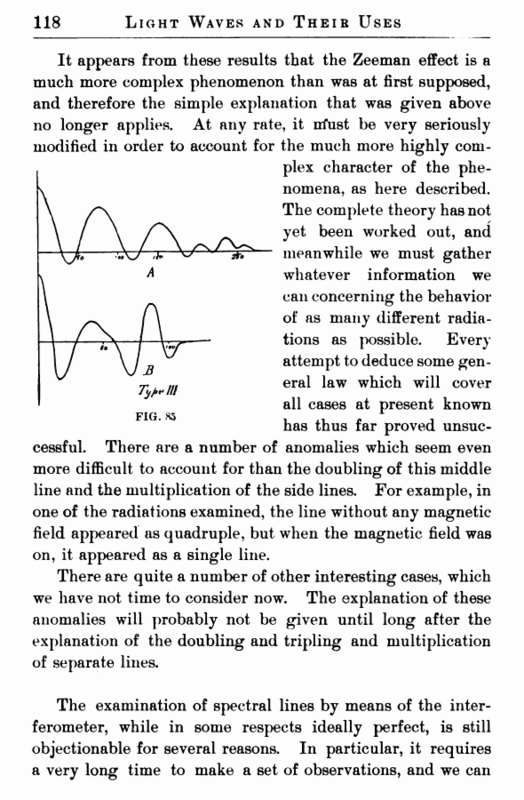 In all cases we can see that the line is double, as in the case of red cadmium light, but in this case each component of the double lines is at least quadruple, or even more complex. 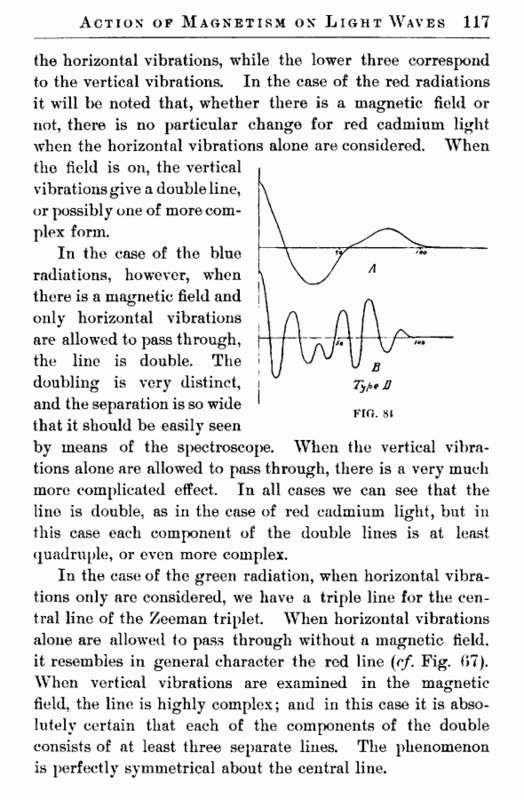 In the case of the green radiation, when horizontal vibrations only are considered, we have a triple line for the central line of the Zeeman triplet. When horizontal vibrations alone are allowed to pass through without a magnetic field, it resembles in general character the red line (r/. Fig. 07). When vertical vibrations are examined in the magnetic field, the line is highly complex; and in this case it is absolutely certain that each of the components of the double consists of at least three separate lines. The phenomenon is perfectly symmetrical about the central line.